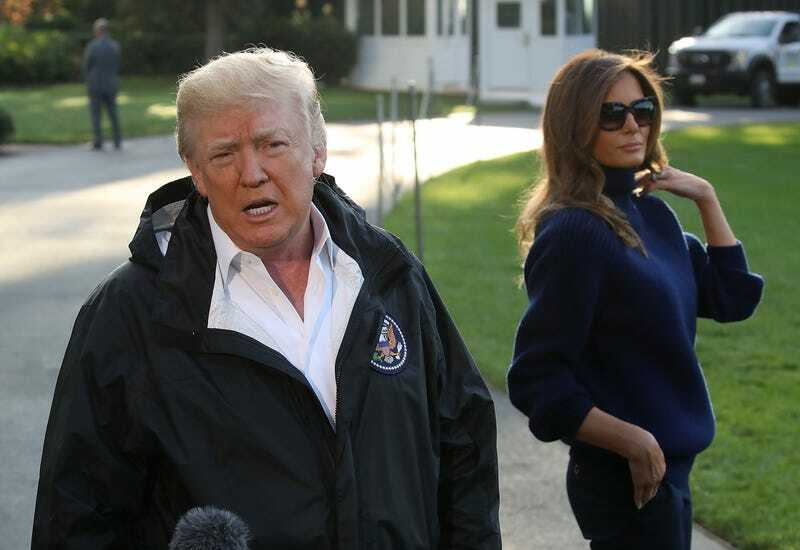 President Donald Trump is scheduled to complete what will amount to a toe touch on the hurricane-ravaged island of Puerto Rico on Tuesday. According to the itinerary posted by the White House, Trump is expected to spend a whopping five hours in Puerto Rico. In fact, he’ll only be spending some 35 minutes with victims of Hurricane Maria because he can’t be bothered with strife and despair. Here’s a look at his official itinerary. San Juan Mayor Carmen Yulín Cruz, who would be well within her rights to say “I’m not going to anything dealing with that man” after the public lashing she has taken for criticizing the president’s obvious lack of empathy, will be attending the president’s briefing, The Hill reports. During a daily press briefing Monday, press secretary Sarah Huckabee Sanders, aka “Suckabee,” noted that the administration reached out to Cruz about the events happening Tuesday. “Look, right now our focus is to bring the mayor into the coordination efforts,” Sanders said, according to The Hill. “This administration, as well as other members on the ground, have reached out to her. We hope that she will join with us in those efforts and be a part of things. She’s been invited to participate in the events tomorrow, as well. And we hope that those conversations will happen and we can all work together to move forward,” she continued. The majority of the island is still without power as some 3.4 million residents struggle to survive. I guess we should be happy that the president was willing to carve out five hours of his day to look in on them. Oh, and let’s not forget that he donated a golfing trophy to them. Read more at the The Hill.